When it comes to managing a comfortable house in Ontario, there is no doubt that a central air conditioner is not only ideal, but often necessary during the many heat waves. According to the Canadian Environmental Health Atlas, heat wave mortality is expected to double by 2050 and triple by 2080. Heat waves are described as a ‘silent killer’ because of the fact that it is something experienced but no visible, and that the symptoms from heat waves can hit the vulnerable sectors quickly and unexpectedly. Environment Canada advises using a central air conditioner to provide a cool home to escape the heat in extreme temperatures. With an increased need for central air, there is now a more affordable way to have a brand-new high-efficiency central A/C put in your home. 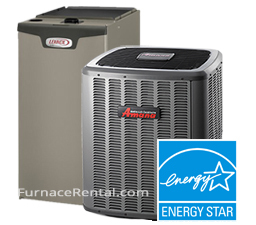 By choosing to rent your central air conditioner you are not only getting a brand-new energy efficient unit, you are getting all the benefits that come with a rental agreement. You get efficient home heating and cooling at a predictable cost, that makes budgeting easy! By switching from an outdated unit to an energy efficient unit, you are able to start saving on your energy bills as well as on your environmental impact. When looking for energy efficiency on a central air system there is a SEER (Seasonal Energy Efficiency Ratio) rating system. The higher the rating, the more you can save on your energy bills. Not only are lower bills a perk of a new energy efficient system, but you can qualify for a government rebate as well. Along with the possibility of some extra cash in your pocket, an air conditioner rental in Kitchener can also provide great piece of mind. One of the biggest obstacles to getting a high-quality cooling system in your home is the initial cost. By choosing to rent your system, you are able to get a brand-new system in your home as soon as the next day. You also qualify for free installation and we can even remove your old unit at no extra cost to you. No matter your credit, as long as you own your property, you are almost automatically approved. Maintaining your savings is a breeze with a rental. Regular maintenance is included in your agreement so that we can keep your unit working as efficiently as possible, maximizing your savings for years to come. The biggest difference between renting and traditional financing methods is what happens when your heating or cooling system stops functioning properly. With traditional financing, this is the time when you start panicking, and calling every company you can find to find the best price from an honest company. The next step is to try and find some money to pay the HVAC professionals to come fix or even, gulp, replace your unit. With a furnace or air conditioner rental, you never have to worry about costly out of pocket repairs! We provide all our clients with an emergency line where they can reach us seven days a week. With a simple phone call, we put you on a list for expedited service so we can fix your issue as soon as possible. When we come to fix your unit, it is at no cost to you. That’s right, all service calls are included in your rental. If we can fix it, we will replace it at no extra cost. When it comes to having fun, Kitchener is the place to be. If you like classic cars, you can check out Cruising on King Street. One of the largest classic car shows in North America, this classic car two-day event features sounds of the 50’s and 60’s including a Beatles tribute band. July is a great time for the younger set to visit and live in Kitchener. Each Tuesday night kids have a date with science and technology with Discovery Square. Free hands on activities are partnered with stage shows to make this the biggest ticket in town for five to 12-year-old kids. In addition, calendars need to be marked for the annual celebration Kidspark, in its 28th year. A fun celebration of entertainment, arts, music and crafts happens each year rain or shine. As much fun as you can have in the sun all summer, residents and visitors also want to feel comfortable in their homes. With a air central air conditioner rental, this can be easier and more affordable than ever.